The best wedding venues in Cancun. 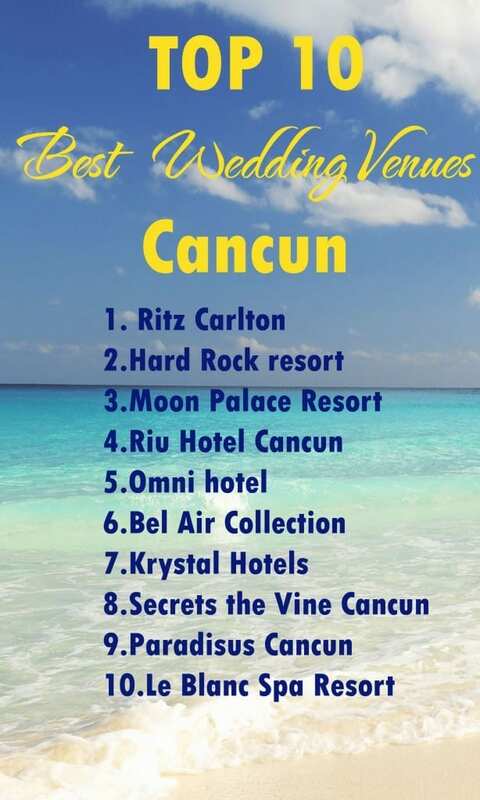 Home page → Blog → Cancun weddings → TOP 10 best wedding venues in Cancun. Cancun is the city of the eternal summer, a popular travel destination and one of the most beautiful places for weddings. One of the main goals that needs to be resolved by the bride and fiancée is to find the best place for the wedding celebration, in order to help you to make the right decision I decided to write this article. Best wedding venues in Cancun. The variety of hotels and resorts in Cancun that organize wedding ceremonies is really vast. It will not be an exaggeration to say that pretty much every hotel located in the Hotel Zone offers to arrange the wedding for you. A natural desire of every couple is to find the best venue that will be able to fulfill every wish and turn the wed day into a fascinating and unforgettable celebration. The fact that popular wed venues offer this service with the hotel division is a big plus, that gives the couple the possibility to combine the wedding with the honeymoon and vacations. One of the most luxurious hotels situated in the center of the Hotel Zone with a fantastic overview of the Caribbean Sea. Here, everything is made according to the style and standards of this world famous hotel chain with a little Mexican flavor. Experience the wonderful getaway in Ritz Carlton, where perfection is the number one rule, this also applies for holding events. A professional team of wedding organizers will make sure that your wed celebration will be held on the highest level in a romantic and luxurious atmosphere. 2. Hard Rock resort Cancun. 3. Moon Palace Resort Cancun. It belongs to the hotel chain of Palace resorts but exactly this one looks like the most popular among them if we are talking about destination weddings. Maybe there is something special in the name of the hotel. Moon Palace, my opinion, it has a romantic name and for sure, this feeling is passed to every wedding held in this hotel. They also have a dedicated wedding team to make your day simply the best one. Again, a chain of world famous hotels include: Riu Peninsula, Riu Las Americas. Every resort can organize the perfect wedding ceremony for you and your guests, with such a long history, that dates back to 1953 (when the international chain of RIU hotel was established) you can be sure that all the knowledge and experience of the Riu wed team will give you a superb wedding day! The Five star Hotel situated right in the middle of the Boulevard Kukulkan (Hotel Zone). It belongs to the international private company which has many hotels in United States and Canada. Luxury united with modern features make this hotel stand out among all the others. Attentive and professional wedding planners will help you to make of your wedding a unique event. 8. Secrets the Vine Cancun. Natural beauty of the local surroundings combined with elegant style of the modern design that is what represents this venue. A private beach ensures that nothing will disturb you from enjoying your special day! I hope this list of best wedding venues in Cancun will help you to find that unique place that you are looking for your special day!